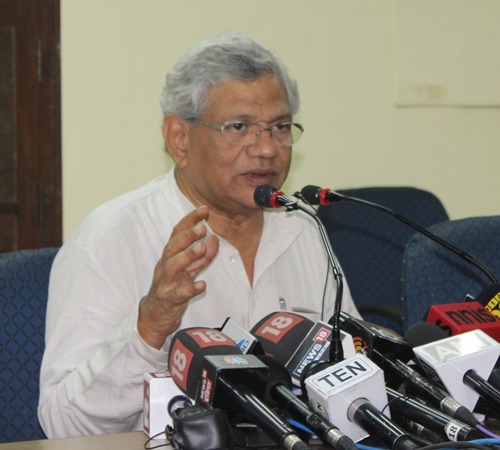 New Delhi: Veteran CPI (M) leader Sitaram Yechury on Tuesday said that what BJP did in Karnataka is a clear cut attempt to cripple the democracy and an attempt to cobble a majority though horse-treading, however, failed. He made an all out attack on Narendra Modi led-NDA government and West Bengal Chief Minister Mamata Banerjee for recent violence in West Bengal panchayat election. He attacked government on slew of issues including Karnataka election, skyrocketing price of petroleum products, recent violence in West Bengal, ceasefire issue of J&K, attack on educational institution and National Register of Citizen in Assam. “Huge irregularities have been reported. The winning certificates were given to those who lost election”, he added.